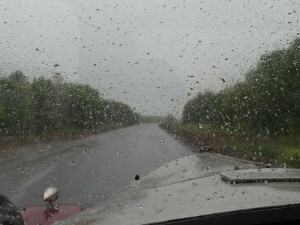 Rainex was our only solution to the rain today as we left Omsk for Tyumen in Russia. Penny doesn’t have windscreen wipers and modern technology comes to the rescue so she can carry us westwards through Russia. Tonight we are tucked up in a beautiful hotel after a quite a long days drive across the flat plains of Russia. I’m not doing very well with keeping up with my blog broadcasts. I intend to, but by the time night comes after a whole day’s driving …. I just fall asleep with my laptop open. James… I take my hat off to you for continuing your updates on all your endurance rallies. I now know what an epic and behemoth effort that took! So…. a wet cold morning on our 16th day of the endurance rally and we travelled over roads of various states from being deplorable to newly paved tarmac. The trucks are unrelenting along the roads and are quite different in appearance than those in southern Asia and India. Most are either red, blue or orange… about the same age… with paint shiny and plain. It seems that the ‘bling’ for them is contained within the cabin, where visors like ornate curtains scallop the interior windscreen with embroidery; unlike in India where pompoms and kitsch tinsel adorns the exterior mirrors and anything which can be tied on to and vehicle murals and designs cover the dings and rust. A much more restrained and reserved expression truck personalisation here. It was really cold and wet in our open car, even with the top on it was still wet inside. The storms have been with us since China and over the past few days here in Russia we’ve had downpours which flash flood roads with the water disappearing as quickly as the storms appear. Whilst at a passage control we were caught in a hail storm and it seemed that most huddling under the shelter at the café thought it was quite an adventure to have such a downpour; and gave many an excuse to have a sit-down lunch at the café! After the Russian border we have pretty much been descending in elevation to the expansive plains of Siberia that are covered in either water and marsh land; or the areas which aren’t bogs, are planted in dark rich soil, with grain or potatoes which grow at an extraordinary rate due to the amount of daylight in the summer. Being predominantly around 50-56deg latitude means that the short summer season doesn’t really sleep and I need to use my eye patch to make dark! Animal life seems scarcer as we travel across the lowlands at around 120mts above sea level. Cows meander across the road drinking from the freshly filled road puddles. Herds of goats and sheep have been replaced by green lines of crops broken by clumps of birch trees; the national Tree of Russia. Camels don’t rock the horizon any more, although I saw a pet camel with its’ two humps protruding from a rather regal green embellished cover. Stuff of fairy tales! I thought camels only lived in the deserts, but they also live in the areas where there is snow and they develop a thick coat which protects them from months of freezing conditions. It is summer holidays here now and campsites with scattered tents and deckchairs lining the swollen rivers, seem to be a familiar pastime here in Russia as is in Australia; and our reputation of having flies is surpassed by the number of mosquitoes and midges here…and they are HUGE! Thank goodness we are both covered up and the Bushman repellant made the journey with us as well! We had a bit of time up our sleeve the other day and we popped in to an artisan craft centre where we saw a blacksmith; felting; carving of antlers and a fascinating process of making metal buckles from wax molds and then heating the metal and poured into the molds. That was a fabulous stop. We often pause from the bumpy driving and have a quick look at things before we continue on under the instructions from the ‘Route book’. I have the best wild strawberry jam; yummy local honey from a stall right beside the bee boxes; inspected stalls with dried salted fish; fox skins; nuts in honey; branches of leaves used like personal fly swatters which hang from flimsy roadside stall frames.. and a fabulous pair of long socks made from yak wool, made in Mongolia; which max spied at a roadside market stall a couple of days ago. I wore them today in the cold and wet… and they helped me be snug. Entering Russia in a rural area was such an eye opener for me. Small villages seemed poor, yet the friendliness of the residents was remarkable. I was surprised and the generosity of spirit and genuine inquisitiveness and joy that our cars seems to illicit in them as we drove through their village. Children ran out to the shoulder of the road and everyone seemed to be celebrating us passing through their ‘place’. The further west we head, even within a day I have noticed the difference in the response we receive. It is becoming much more reserved. I wonder what it is that seems to hold back people in the cities from expressing the child like joy that adults expressed in the poorer eastern parts of Russia. There are timed sections where as competitors our ability to navigate and negotiate the test sections in accordance with the appropriate rules, then determines the place we are in the rally. As of today we are in 17th position overall and still are eligible for a Gold medal. We have complied with all the time control sections and been in every night without the assistance of a truck. The green Gobi desert expanded across to the west where we drove and the summer rains and storms continued, providing the earth with necessary water; which also meant that the Russian mud that not only stopped armies; has also stopped some of our time trials. One that was not cancelled was a section of closed sandy forestry road which was just fabulous. I must say I wished I could have been in Bruce and Harry Washington’s car (a fellow Australian, who is leading the competition at present) just to feel like what it is like to go fast sideways around those curves! I have so much more to share about thins incredbible adventure….the shoulders of yellow and white flowers… and the birch trees which look like magnified hairs on the landscape… walks up hills to shrines and prayer wheels in Mongolia….the architecture of the homes and cities…. the bridges… the cemeteries… the people… the celebrations for the “Peking to Paris’ as we arrive into towns…..and where Max and I stopped and interacted with the people or stopped to investigate something I had seen; but all of that that will have to be included in my book… because I honestly don’t have time to write it all whilst on this journey. Penny is doing great. She is remarkable… whirring along brilliantly. A few minor hiccups and a flat tyre today and she is still going great. There have been four cars retire and the sweeps have been instrumental in keeping probably nearly one third of our group continuing on their way to Paris. 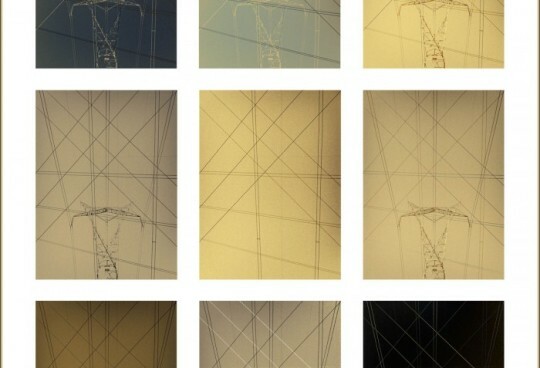 I will write more when I can and upload galleries when internet isn’t bogged down. Ive just grabbed a few pics now and will have to sort my galleries and broadcast more when we get back home. I haven’t looked at the route for tomorrow, yet I saw it was a shorter day. It isn’t wise though to be expecting to have a nice bubble bath on those shorter days… because often those roads are difficult and they can actually be so challenging to traverse that the late check in time signals dinner and sleep! …So .. I’m off now to look at the route book (after quickly ducking down the elevator in my PJ’s because I wanted to check if there were any updates on the communication board) an see what time start is today with our clocks changed another hour. Each hour time change means we have more kms under our belt as we head west toward Paris.